The PCE-XM 100 Microscope comes with a mechanism that can aim (a cross in the eyepiece) and a system for positioning and measuring displacement (x-y axis markings). This allows the microscope to be focused on a specific point over the surface of the stage, moving the sample until a second measurement point appears under the cross and then the distance can be read. This allows to measure distances perpendicular to the lens axis. This microscope is an attractive instrument due to its high resolution. It is easy to use thanks to its robust design. 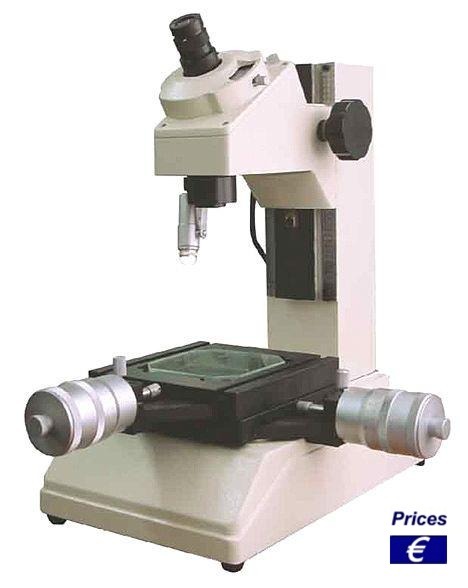 This microscope can be used in all industrial sectors. Another type of microscope can be seen here. To achieve the maximum result you can purchase this lens which magnifies to 10x. It will achieve the microscope maximum of 150x. This component is placed on top of the microscope eyepiece by means of an adaptor ring. It comes with software allowing images and video sequences to be transferred and stored on a computer.